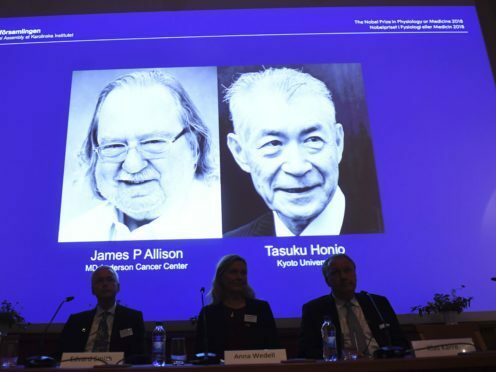 James Allison of the University of Texas and Tasuku Honjo of Japan’s Kyoto University did parallel work to stimulate the body’s immune system’s ability to attack tumours. The two winners made discoveries that “constitute a landmark in our fight against cancer”, according to a statement from the Nobel Assembly of the Karolinska Institute that awarded the prize. Dr Allison studied a protein that acts as a brake on the immune system and the potential of releasing that brake. Mr Honjo separately discovered a new protein on immune cells and eventually found that it also acts as a brake. One famous recipient of the new treatment is former US president Jimmy Carter. Mr Carter was diagnosed in 2015 with the skin cancer melanoma, which had spread to his brain. He was treated with a drug inspired by the research of Mr Honjo, and announced in 2016 that he no longer needed treatment.